If using bulk orchard apples, you will be best off using a press of some kind, for bulk cider production. Our family now has a large press that can process 8-12 boxes of apples per hour (about 10 gallons per hour). You can also purchase freshly pressed cider for around $6-8 (which, compared to purchasing raw ACV in the store, is still a pretty good deal). Look for RAW cider preferably. Once pressed, the juice is lightly filtered (with a large colander) to remove the biggest chunks of apple. You want to remove large pieces, but keep the sediment. whereas fully strained, clear liquid with no sediment/particles is “juice“. We pour fresh cider into very clean gallon and half gallon glass jars or plastic cartons. You want the jars super clean to avoid contaminants. We learned that sanitation is important and had better luck with the cider not molding by using a light bleach soak of the jars, then rinse and dry OR rinse jars with boiling water. New plastic containers should be clean. Raw apple cider contains natural yeast, but to encourage faster fermentation and reduce risk of spoilage, add approx. 1/4 tsp. baker’s yeast (or any wine/beer/cider yeast) per quart of cider. Just sprinkle the yeast on top. 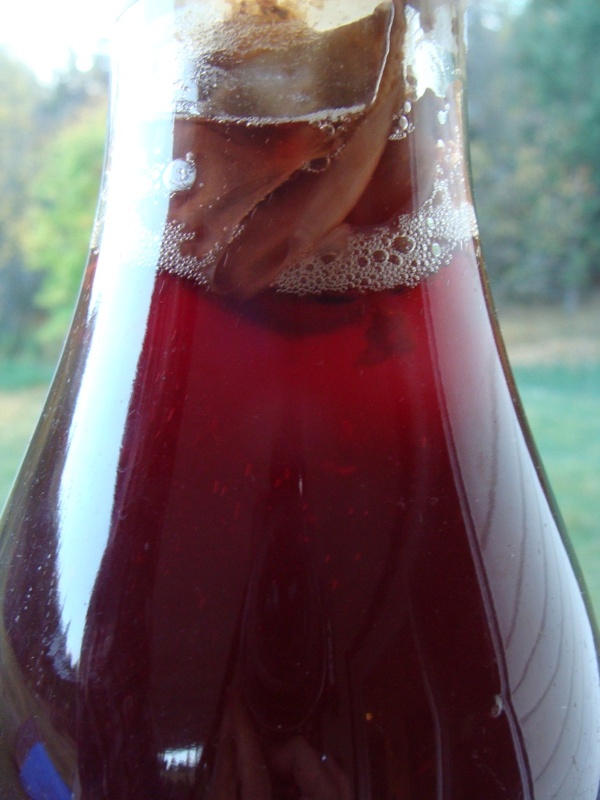 Sugar can also be added to the fresh cider to promote a stronger vinegar. I have not yet added sugar (except in small batch experiments) and probably won’t start – because our apples always seem to make a very strong end cider (higher sugar = higher alcohol = stronger vinegar). If using summer apples or green apples (neither of which are recommended for vinegar due to their lower sugar content) then sugar should be added. Place cheesecloth and a rubber band or a loose plastic lid on top of the jar. If fruit flies are a problem, you can place cheesecloth or wax paper over the top, then loosely tighten the lid just enough that gas can escape but the flies can’t get in. Vinegar on the left is pear (really dark). On the right is newly started cider with mother, fizzing. 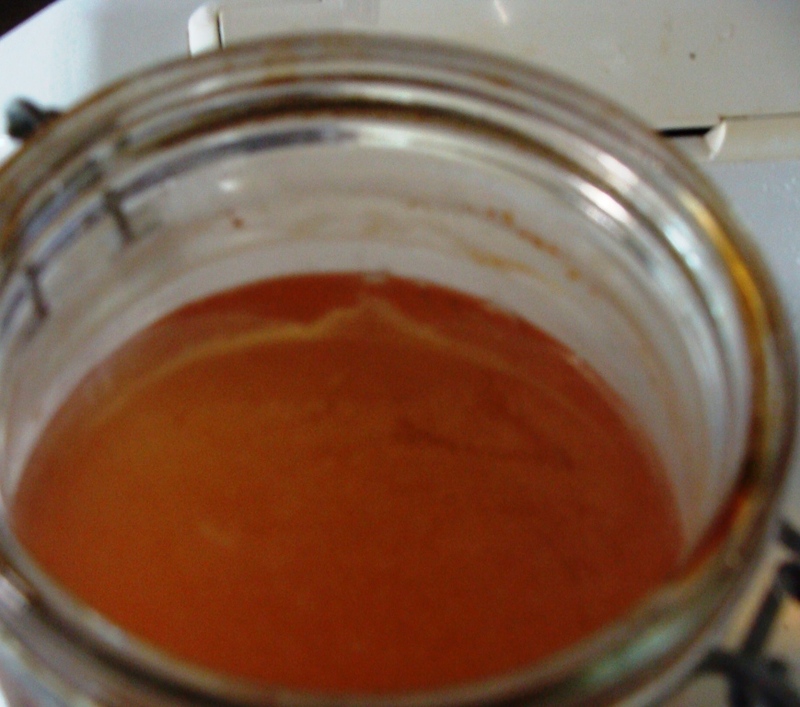 In the middle is partially finished vinegar. Once jarred, let the cider set out at either room temperature (fast-acting, full process takes a couple months or so) or in a fridge (slow-acting, takes several months) preferably in a clean, dark location. If kept in the fridge, the cider takes about 2 weeks to start to “turn” to alcohol. If left in a warm area (60-80F), bubbles will start forming after as little as 24 hours. 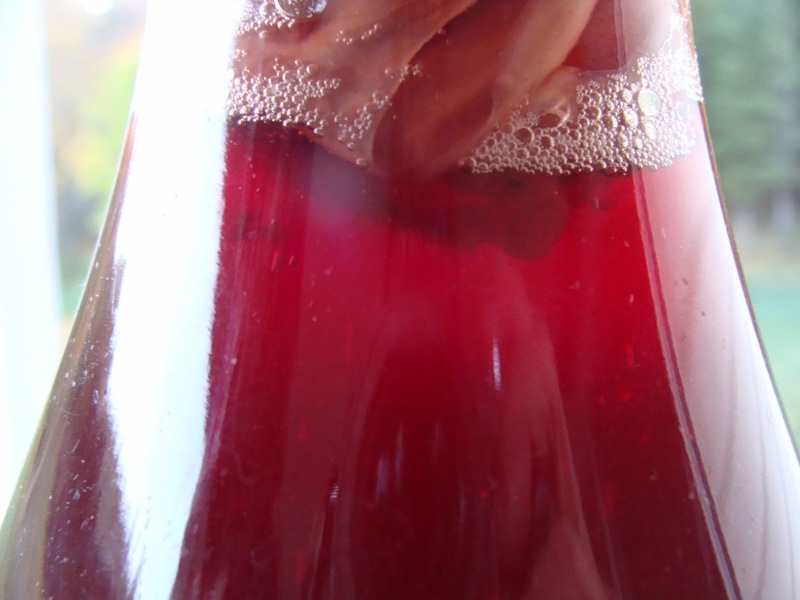 Full fermentation to vinegar can take months. The benefit to this slow process is that the bacteria work slowly, so problems can be caught early, which is handy for a beginner. I now always keep my cider at room temperature, but I know what I am looking for/at and how to do corrective actions for potential issues. The only time it’s not ok to have mold is if the mold is interspersed throughout the liquid – I had that once, yuk! Dump it and start over! Cider/vinegar should never taste or smell musty or moldy. I add a bit of last year’s mother and vinegar to each jar. You can buy it at stores if this is your first year: buy a “raw unfiltered” variety. Around 1/4 cup should be plenty for half a gallon of cider. Store bought jars may not visibly have “mother” or “cultures” floating around inside, but you should be good to go if the jar specifies raw and unfiltered. 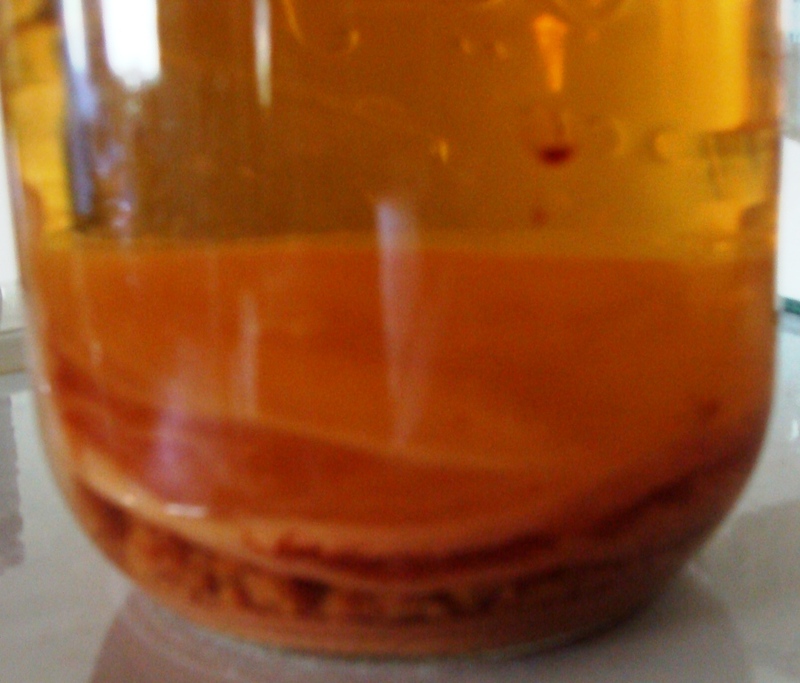 Once you have your own vinegar, you will notice that the jar will sometimes seem to collect more and more “mothers” – layers of gel-like discs the diameter of where the top of the liquid is on the jar. These discs will remain somewhat separate. Mother cultures generally develop as a film on the top of the jar, with time they may sink to the bottom. When I have a new batch of vinegar to make, after the foam is scooped off and the cider is starting to turn to alcohol or vinegar, I grab a piece of “mother” and rip it to the size of the top of the jar and lay it across the top. Usually the gel floats on top, and provides a nice protective layer and good enzymes to get the vinegar active and protect from any further potential mold. Note, this red is a berry cider. Apple cider is brown. Then I watch them over the next few months. The liquid will bubble and turn to alcohol then turn to vinegar. Very entertaining! I know the vinegar’s done when the liquid is clear and solids have settled to the bottom. I then decant into new jars, pouring off the clear top and leaving the sediment. I like to pour into old glass milk bottles for this, because I have a ton and they pour well and look cute. Can you use other types of fruit to make vinegar? Sure! Old wine sometimes becomes vinegar. I’ve done pear, which is a flat but tasty vinegar. We are brewing Cherry and Mixed Berry this year. I have a friend that lives in a tropical region that says pineapple vinegar is the best, would love to try that! Can you use pasteurized apple juice? YES: If you add raw mother/culture from active vinegar, you can try to use pasteurized cider. The resulting vinegar will likely be weaker because most store bought cider is watered down (unless you go to a farm or store that sells fresh pressed cider). 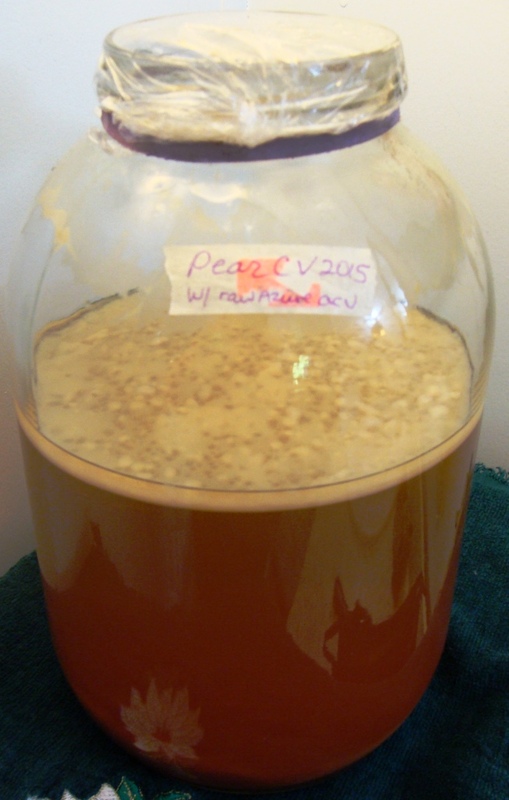 What do I do with 10 gallons of ACV each year? 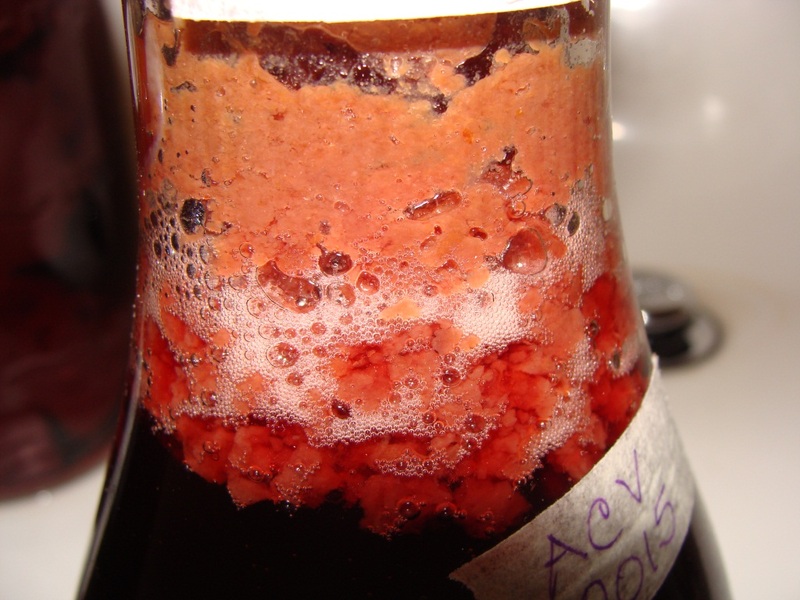 A warning for using ACV as a cleaner, maybe you already know this – if you have a productive ACV it will continue to make mother. I will strain out the mother, but it doesn’t all strain out, and it’ll grow more thick mucousy film. I tried to put the ACV in a spray bottle, but it kept clogging, so now I just pour it onto a sponge and wipe the sponge across all the surfaces I’m cleaning. 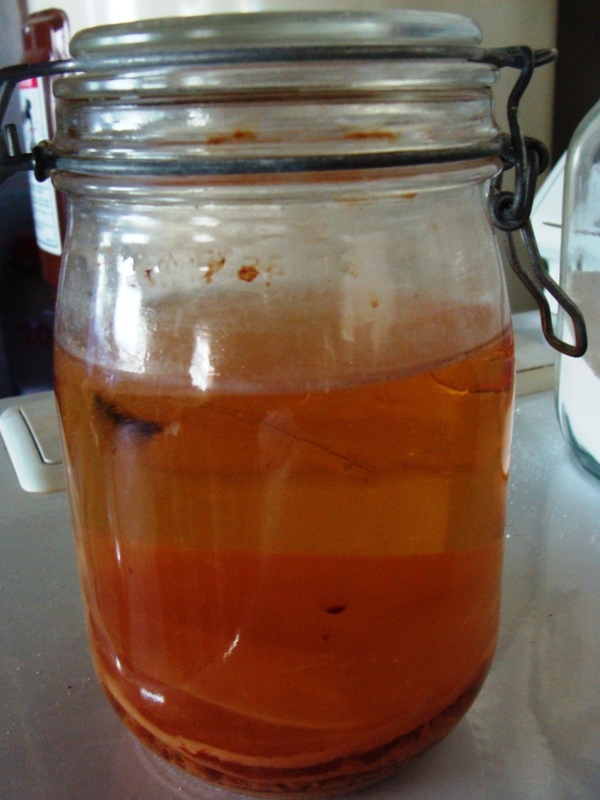 **You can prevent film/mother from developing by pasteurizing the vinegar. Heat to 150F in a pan for a few minutes, then cool and re-bottle. The vinegar should not become filmy anymore (if it does, you didn’t heat long enough). Be sure to mark the jar as pasteurized so you don’t accidentally try to use it as a starter for your next batch of vinegar! When following the recipe using straight pure apple cider, our finished vinegar pH measured: 3.5 The book by Proulx & Nichols discusses how to measure acidity & what pH is desirable for vinegar. My ACV is fermenting beautifully! Thank you, Michelle!